If you’ve been curious about Tatau.io and want an in-depth explanation of what we’re doing, wait no more and download the Tatau.io white paper. The TL;DR version of Tatau.io is that we’re bringing together suppliers of computing resources with those companies that need to consume them, on a global scale. Why? Because Artificial Intelligence, Deep Learning and associated technologies such as Augmented Reality and Virtual Reality, as well as graphics/video rendering and predictive analysis, will demand an exponentially increasing amount of computing power. We believe that no single player will be able to meet that insatiable demand, and that a distributed solution is needed to provide the required computational capacity in a sustainable fashion. The world will be AI-driven within the next few years. It’s an exciting world, and it requires vast amounts of hardware and computational power. Without accelerated and easily scalable computational capacity, AI will not be able to deliver on its promises. This requires going beyond traditional, general-purpose central processing unit (CPU) computers to do the work. 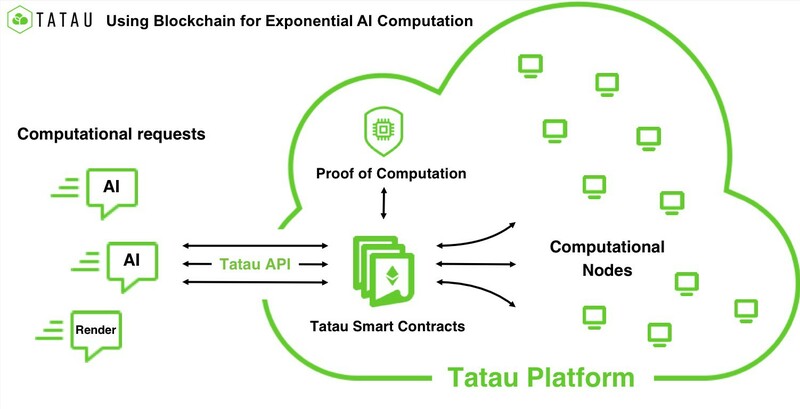 Tatau.io will provide access to massively parallel graphics processing units (GPUs) along with CPUs, and rapidly developing technologies such as field programmable gate arrays (FPGAs) as part of its distributed computing capacity offering. This distributed technology mix is the best way to effectively meet the increasing demand for computational power, as it speeds up processing significantly while reducing energy consumption for a lowered environmental footprint. Tatau.io exists to meet that computational demand and move AI forward in a secure, transparent and affordable way. This enables everyone, small and large, who has spare GPU computing capacity to sell it to those that require it via the Tatau.io “computing on tap” platform. It represents an exciting opportunity to democratize and commoditize large-scale computing tasks, a notion that Tatau.io is now realising. Please have a read of the white paper, and tell us what you think — we welcome feedback. Sign up here to receive email updates. Follow us on Twitter, LinkedIn and join us on Telegram.